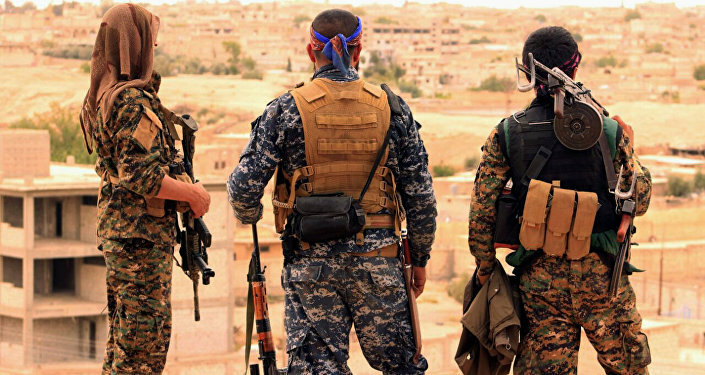 MOSCOW (Sputnik) - Kurdish-led Syrian Democratic forces (SDF) have agreed on the transfer of control over the northeast city of Manbij in the Aleppo province to the Syrian army that will enter the city in the coming days, a Kurdish security source told Sputnik on Saturday. "The agreement was reached, under which the Syrian Arab Republic’s army will enter the city of Manbij, controlled by the SDF,” the source said. On January 20, the Turkish General Staff announced the beginning of the Operation Olive Branch, aimed against certain Kurdish forces, in Afrin. Ankara considers the Democratic Union Party (PYD), a Kurdish political party in northern Syria, and Kurdish People's Protection Units (YPG) militia affiliates of the Turkish Kurdistan Workers’ Party (PKK) listed as a terror organization in Turkey. Following the launch of the operation, Turkish President Recep Tayyip Erdogan said that Ankara’s operation may be expanded to the city of Manbij and other Syrian regions bordering Turkey. Damascus has expressed its opposition to the Turkish operation, saying that such actions violated Syrian sovereignty. Earlier, the Kurdish forces reported that 308 Turkish servicemen were killed since the start of the Olive Branch operation in Afrin. Turkish President Recep Tayyip Erdogan claimed however, that Ankara could extend its third military advance, vowing to "completely clear the region of terrorists, beginning with Manbij and throughout our entire border."